This Rumble ended on 2003-10-01 00:00:00.0. Power: Dwarf like beings immersed in the magic of the Graygem. Big Mistake: Teaching wild sorcery to three elves who unleashed a power so great it nearly destroyed a third of the continent’s population. Power: Dwarf like beings bestowed with near-godlike power. Big Mistake: Becoming a cruel and arrogant race which attacked the world wiping out nearly a third of a continent’s population. The scion Gharein K’Thern climbed to the summit of one of the numerous mountains of the Khalkist Mountain Range. 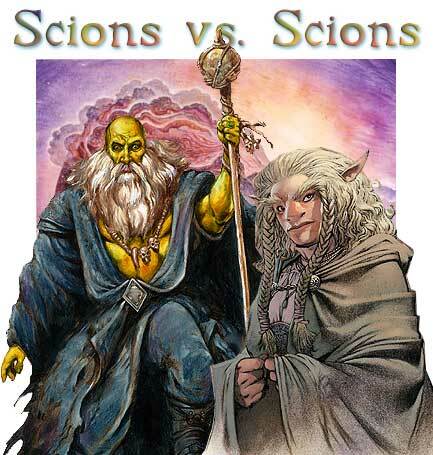 As he sat down on a boulder overlooking Ansalon the morning sun crept above the horizon, its yellow-orange rays of light reflecting off the gold skin of the Scion. He had seen a millennia of sunrises during his lifetime. This one was particularly beautiful and yet he felt oddly uncomfortable. Something was wrong. A second bright light appeared on the horizon and it was growing. Standing up Gharein leaned upon his staff and watched this anomaly as it came nearer. Muttering the words to a spell the Scion wrapped himself in a protective shell of magic. It was obvious that the light was coming straight for him. Staring in an almost unconcerned manner he patiently waited for the arrival of the strange visitor. The light stopped abruptly as it neared and landed at the Scions feet. The light cascaded to the floor in sparks revealing an odd looking individual. He assumed it was a dwarf of some type, but not one he had ever seen before. Shar looked quickly around her and then inspected the man in front of her. Her mission to investigate new worlds for the Scions of her world had led her here. This was said to be a world that had simply appeared where none was before. She was to evaluate the amount of resistance her people would encounter when they decided to take the it for themselves. Words of welcome were on Gharein’s lips when the woman unleashed a burst of arcane energy in his direction. Not expecting the attack the scion took the full brunt of the spell and was staggered backwards. The protection he had previously cast deflected most of the damaging effects. Enough to prevent him from taking any real harm. Looking up he noticed that the woman had a look of surprise on her face. The scion Shar was amazed that the golden-hued dwarf had not been incinerated where he stood. That was almost impossible. If all the inhabitances of this world were are tough as this her people would not have an easy time taking over. Gearing up for a fight Shar began to chant. Seeing the obvious intent of his attacker Gharein prepared to defend himself.